LARS has recently completed the design, fabrication and erection of a training tower for the North West Ambulance Service HART team. The Hazardous Area Response Teams (HART) was established because of a requirement for ambulance service paramedics to triage and treat patients within particularly hazardous and/or potentially contaminated areas. The HART team works alongside fire and rescue services within the inner corden of a major incident. Their job is to treat casualties and save lives in very difficult circumstances. 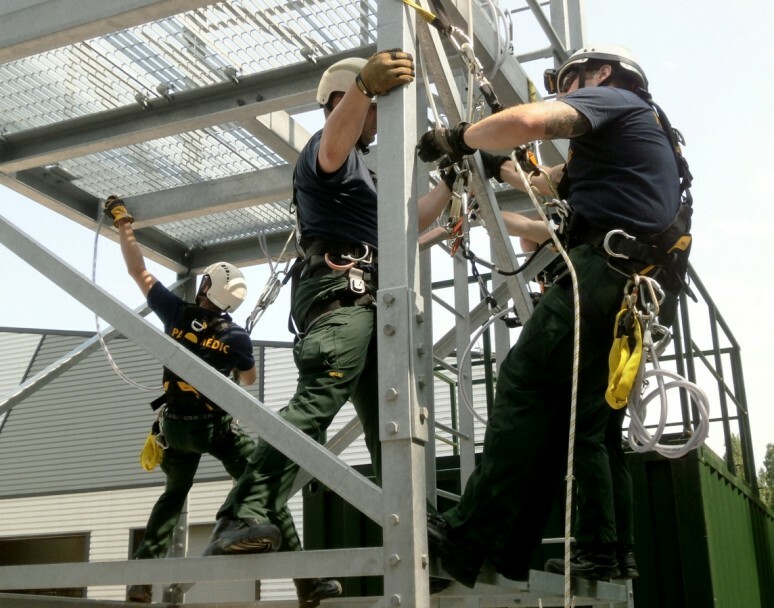 The purpose of the tower is to provide an adaptable training at height facility for the team. The scope of works for LARS comprised the base construction to support the tower, fabrication of the structure and erection of the tower on site. The tower is 8 metres high and incorporates various climbing elements designed for different working at height scenarios including 2 working platforms with access hatches, fixed ladder access from ground level to the second platform hatch, mast climbing pegs and mast climbing staples. Standard eye bolts have also been fitted to act as secure points for safety lines to allow personnel to climb the tower externally. The tower is complemented with storage containers to simulate further hazardous scenarios. HART Team Leader at North West Ambulance Service (NWAS), James Woodsell said: “This has been an exciting opportunity to be involved in from start to finish. The facility allows us to greatly enhance how our emergency services team are trained to respond to a range of realistic scenarios where certain potential dangers are involved. “This is particularly important for our Hazardous Area Response Team (HART) who are specifically experienced in responding to patients who are in high risk locations. To have a training facility such as this is excellent news and will be invaluable to help support our staff to conduct their training both realistically and safely.